This package includes both 2D and 3D versions of the film. The remarks above discuss the 2D edition – how does the 3D presentation compare? Picture quality seemed similar, as the 3D image maintained solid sharpness. Colors remained about the same, and blacks seemed just as strong. Brightness took a minor hit, but not as much as I feared. Given the dark nature of the film, I worried much of it would become impenetrable, but low-light shots still offered pretty good clarity. As for the 3D imaging, that aspect of the presentation left a lot to be desired. The movie offered mild depth most of the time and little else. The space battle that made up the film’s climax offered a few tasty 3D shots, primarily when we got a “first-person” view from Rebel ships. A few other slightly effective bits popped up as well, and the movie presented passable dimensionality to less active scenes. This left the 3D version as a disappointment, for the 3D elements really didn’t add much to the experience. 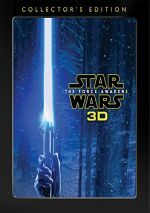 In the future, I’ll still watch the 3D edition because there’s no compelling reason not to view it. However, there’s also little to entice me – it’s a bland 3D rendering. Most of the set’s extras show up on Disc Two, and the majority appear under the banner The Stories. With a total running time of one hour, eight minutes, 58 seconds, the domain breaks into 10 featurettes: “A Rogue Idea” (9:00), “Jyn: The Rebel” (6:16), “Cassian: The Spy” (4:14), “K2SO: The Droid” (7:43), “Baze and Chirrut: Guardians of the Whills” (6:20), “Bodhi and Saw: The Pilot and the Revolutionary” (8:35), “The Empire” (8:18), “Visions of Hope” (8:24), “The Princess and the Governor” (5:49), and “Epilogue” (4:15). The featurettes look at the film’s origins and development, how director Gareth Edwards came to the project, story/character areas, cast and performances, sets and production design, costumes, effects and related areas. “The Stories” manages to offer a pretty good overview but not a deep one. 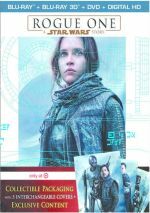 A fourth disc presents a DVD copy of Rogue One. It includes none of the Blu-ray’s extras. Part of a Target exclusive, a fifth disc gives us a DVD with two Story Selections: “Inside the Creature Shop” (6:02) and “Digital Storytelling” (4:31). In these, we get notes from Doug Chiang, John Knoll, Hal Hickel, Greig Fraser, director Gareth Edwards, creature supervisor Neal Scanlan, supervising animatronic designer Gustav Hoegen, visual effects supervisor Mohen Leo, ILM model supervisor Russell Paul and Lucasfilm Visual Effects VP Janet Lewin. “Shop” looks at creature design/execution, while “Storytelling” discusses the combination of effects and photography. Both are brief but reasonably engaging. Back in 2014, director Gareth Edwards made an erratic Godzilla movie. To prove this wasn’t a fluke, in 2016, Edwards created an erratic Star Wars movie. Though it comes with some good moments, Rogue One lacks the qualities to match up with the franchise’s better entries. The Blu-ray offers very good picture and audio along with average supplements. Rogue One offers decent entertainment but it fails to deliver a great Star Wars tale, and the 3D version doesn’t add much to the proceedings. Note that the 3D Blu-ray of Rogue One can be purchased solely as a “retailer exclusive”. The version in this review comes from Target and includes the added bonus materials on a DVD. A Best Buy package lacks that extra DVD but houses the discs in a “steelbook”.